I must start by addressing a question: Against what yardstick or standard is it fair to draw a comparison? 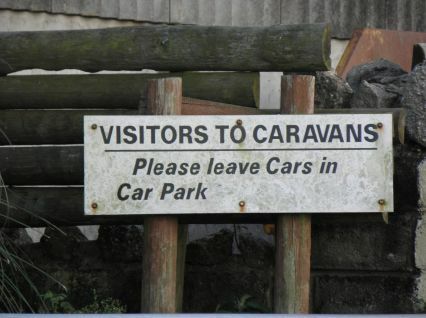 What, in other words, makes a "campsite". A campsite is a provision of a composite set of facilities in exchange for a fee. The facilities on offer vary between campsites, as does the fee. At one extreme, all that you may get is a farmer's field, a source of drinking water, and a latrine, for which the fee would be correspondingly modest. At the other extreme, in addition to those basics you may get additional facilities, such as showers, hot water for washing up cooking/eating utensils, clothes washing/drying facilities, electricity hookups, a shop that sells basic commodities (possibly a cafe selling hot prepared food), refridgeration of perishable foods, pre-installed tents, mobile homes or similar accommodation, a swimming pool, a club house with bar and evening entertainment laid on, and so on. Each of which would come at a cost. I have attempted to list these items in decreasing order of priority, but that ordering is subjective and will vary in the opinions of others. 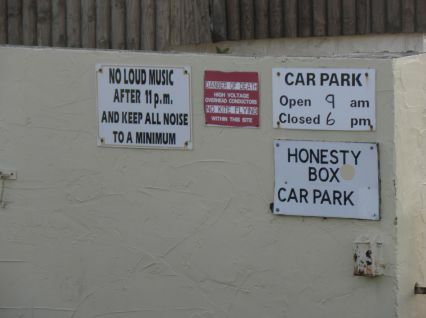 The availability of some of the more sophisticated facilities such as a club house would be an active disadvantage for some customers, as they might attract to the site a "louder" customer profile than that which is desired by the customer (even if he would not personally avail himself of the facility provided). As mentioned above, the charge varies according to the facilities provided. But there are other factors also affecting the charge: The desirability of the location is one, and the concentration of competing sites is another. These affect supply and demand, and the basic principles of economics prevail. In many cases the additional site charge for the provision of additional facilities may be modest, because the cost of provision of those facilities may in part be recouped by additional charges for their specific use. In many campsites, there is an additional coin-operated charge for hot water in (eg) showers, the price of which may exceed the marginal cost for the provision of the hot water, with the excess contributing to the capital cost of providing the facility. Certainly this would be the case with clothes laundering facilities, and as the current UK tax regime would typically allow a 100% write-off of the capital cost of equipment against taxable income the immediate cost to the landlord is to some extent mitigated. So, before going into detail, the reader has to be aware of the costs involved. I was in a party of 4 (2 adults + 2 children) in a single tent, requiring no electric hook-up, for 6 nights. We had originally booked for a third child (total party of 5, single tent) but one child, a friend of the family, fell ill just before embarking and was left behind. The basic charge for a family of 5 was £20 per night for which we had to pay £60 deposit up front. For a party of 4 we should have been charged £17 per night. We were offered no discount for the fact that we only arrived as a party of 4, and we were charged full whack for a party of 5 despite that we made the circumstances clear to the management on booking in. This factor alone gave me a negative opinion of the campsite which would require a lot of compensatory factors to overcome. We were somewhat held to ransom by the fact that we were meeting several friends who were independently booked into this campsite. Otherwise I would have been sorely tempted to surrender the deposit and go elsewhere. The nearby Hill End campsite required no prior booking, although that may have been a function of the prevailing weather. It was certainly not an attitude calculated to encourage a return visit. It is reasonable to use the Hill End campsite as a focus for comparison, because although the charging structure is slightly different the bottom line works out about the same, and the locations are very similar in attractiveness from a geographical standpoint. Presumably this is designed to minimise occasions of empty hook-up pitches. I cannot comment on the reasonableness or otherwise of this policy - it is purely a question of economics for the landlord, and as a consumer if you do not like the terms there is no need to contract. The restriction is not evident from the web site but presumably would become so at the point of booking. The Hill End site does not provide a hook-up option at all, so Llanmadoc can effectively set its own terms. The basic location is extraordinarily good, and this is its major selling point. It is within easy walking distance of a beach comprising a vast expanse of sand and is a reasonable launchpad for headland walks. The Hill End site is even closer to the beach. Both provide a shop/cafe, but these facilities at the Hill End site are considerably more comprehensive. Furthermore, if your party is into surfing or bodyboarding, the angle of the beach to the ocean affords better waves at the Hill End area of Rhossili bay. 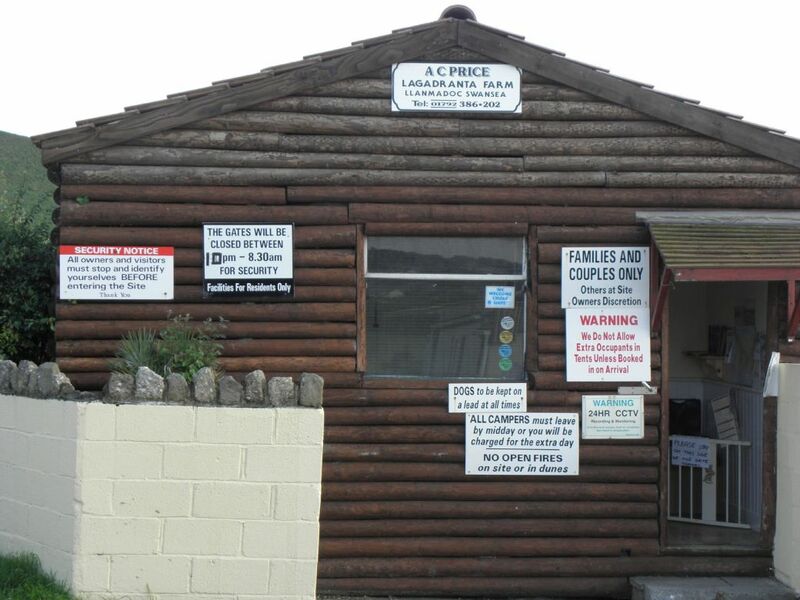 The Hill End site does does provide launderette facilities, which the Llanmadoc site does not. The importance of such facilities is subjective, but must carry a premium in value in an area in which it rains 25 hours per day, 8 days per week. Given that such facilities normally also pay for themselves through contributions received at the point of supply (ie coin-operated machines) one cannot help but feel that Llanmadoc misses a trick here. Launderette facilities do require housing, and if such under-cover space is simply not available without a bespoke building project then it is understandable that this may have delayed, perhaps permanently, the provision of this facility. Having booked in, the next immediate source of discontent was the state of the pitch itself. I may be spoiled, but I am accustomed to using campsites that pay lip-service to keeping the grass to a reasonable length. Here we had what can best be described as a meadow; the typical "farmer's field". This could be a boon if you happen to have turned up without a Karrymat or inflatable mattress, with nothing but the grass to cushion your delicate body from the hard earth. To the rest it is a positive pain. The field is on a gentle incline. It is inconvenient to arrange your sleeping arrangements so as to minimise the inevitable discomfort associated with this effect, but to be fair it is rare to find a campsite that is immune to this problem, and it was not a major issue for me. Possibly the incline may have provided drainage advantages as a shield to ward off the incessant rain. At least the tent pegs went into the ground without problem (contrast my recollection of an Italian campsite in the shadow of Mont Blanc: half an inch of rotting vegetation followed by solid bedrock). All in all I have known better and worse pitches. 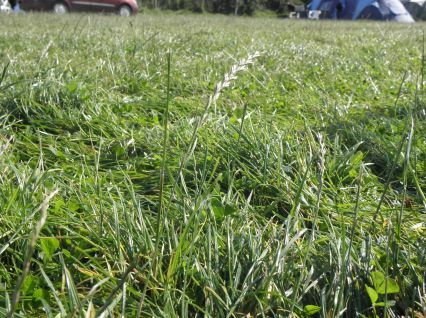 This was grudgingly among the better, the irritation (grass length) being felt particularly acutely only because it is so easily correctable, at negligible cost to the landlord (hell, the grass may even be worth something in an agricultural industry), and neglected purely out of laziness. Moving on to the restrictions imposed upon the timing of the availability of facilities, we enter the realms of the truly bizarre. As a customer, you are restricted severely on the times of day within which certain critical activities may be performed. I only have a few weeks' holiday per year, so it is very much a matter of "seize the day" when they crop up. In the summer it gets light early and gets dark late. I am up by 07:00, breakfasted by 07:30 and then vroom! I want to be off site and doing whatever I plan. At the other end of the day I can well imaging wishing to return to the camp site after 22:00. 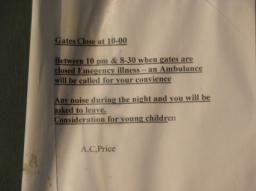 The gates used to be closed from 21:30 to 08:30, and the heavy black "10" in the photo opposite, obscuring the previous "9:30", is at least a minor acknowledgement of the deep discontent with the previous restriction. We are advised that the restriction is "for security". It is hard to imagine what security objective is furthered by this restriction - site access is not in any way barred, you simply cannot move your vehicle. I venture to suggest that the hidden agenda behind this restriction has less to do with the security wellbeing of the customer than it has to do with the prevention of "freeloaders" turning up late at night, leaving early in the morning without paying. Whilst one must sympathise with the landlord's plight on this issue, let us be in no doubt that the adopted solution is at the cost of the convenience of the paying customer. "For security", it may be, at one extreme distortion of the meaning of the term, but for the protection of the landlord's revenue stream, not the camper's possessions or person. The suggestion that in the event of an emergency during the hours of curfew, an ambulance will be called for the distressed camper (no instructions about how this is to be achieved are provided) is particularly amusing. What if the emergency is off-site, say I get a call to the effect that my house has been burgled or my elderly parent (at home) is taken ill? How, then, can I leave in the middle of the night? 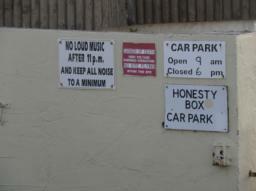 The timing restrictions on the (recommended) car park are even more onerous. The shower and washing facilities have in one sense a welcome change from trends in other campsites: The hot water is free of additional charges. You don't have to hoard your 20p coins (but the sting in the tail comes later). 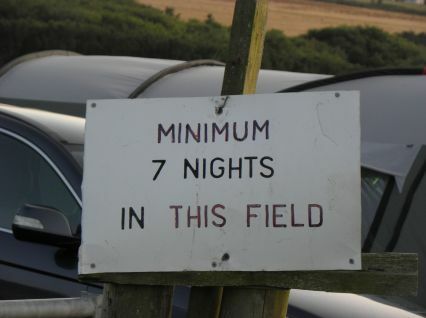 We are advised that the restrictions on hours is (if believable) because non-residents to the campsite used to take advantage of these facilities. Once again, the paying camper is penalised in order to protect the landlord from freeloaders the presence of which would present minimal inconvenience to the camper but a loss of revenue to the landlord. The photo is of rather poor quality - apologies for that: The permitted showering times are between 08:30 to 11:00 and between 16:30 and 20:00. Sheesh! Personally, if I had to pay the odd 20p for a shower (possibly adjusted by a nominal reduction in the principal site fee) and in consequence were permitted to shower whenever I liked, I would regard this as preferable. Others may disagree, but consider: such a solution would ensure also that the landlord is revenue-protected should the facilities be used by non-residents, so there is the potential for everyone to be happy. 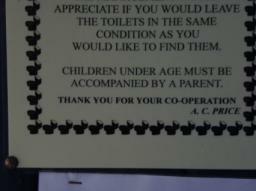 Incidentally, if you are confused by what is meant by "children under age" who must be accompanied to the showers or toilets by an adult, the "age" is 8 years. This is only apparent from the website. Otherwise you might be misled into thinking that the normal legal age of majority applies (18 years)! Dish washing facilities are so dire that they deserve special mention under their own dedicated heading. For the entire camp site there are only two sinks provided for dish washing, only one of which has a hot water outlet. (The other sink has what appears to be a hot water outlet but is heavily labelled "COLD" so presumably doesn't work - I was not prepared to pay 50p to find out for certain). Before discussing the hot water, I am reminded of an exercise in fluid mechanics that kept me occupied in a state of confusion for many hours once as a young child, the solution to which I was never enlightened. It may not work every time, but I had found that if you take a cold water faucet and turn it on verrrry slowly until just a thin dribble of water ensues (marginally faster than individual drips), and then stop and wait, then after a brief delay the dribble will dry up. Once it has stopped running, repeat the process by turning the faucet very slightly more until the dribble continues, and then stop turning. Lo! the dribble dries up again. You can continue this iteration for quite a long time until you eventually get a dribble of water which never dries up. If you measure the total angle through which the faucet has been turned in the entire process since commencement, it is quite a significant amount which, if you had turned it to this angle in one go from the outset (or even slightly less) you would have received a gush of water far stronger than any of the preceding dribbles and which would never diminish. Well, I never did understand what gave rise to these inconsistent observations, but I was reminded of the exercise by the cold water faucet in the dish washing facility at this camp site. You could turn the faucet on full whack and never get more than the dribble of water that I achieved in my youthful experiment. 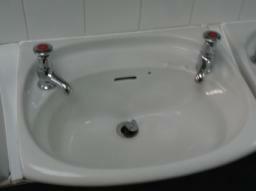 Indeed, if both sinks were in use at the same time, no water whatsoever would emit from one of them. As regards the hot water, for washing dishes this is not free of charge (contrast showers and other washing facilities - why the inconsistency?). For washing dishes the hot water comes via a coin-operated dispenser, at £0.50 per throw. Only 50p coins are accepted (so you are not exempted the bind of hoarding those coins, after all). And what does the 50p purchase? Well, it is certainly not a fixed quantity of hot water. No sirreee. It buys you the right to draw on hot water for a fixed period of time. And that period is about 3 minutes with no breaks. Use it or lose it. The cost to the landlord, meanwhile, is in direct proportion to the quantity of hot water drawn down. So this is simply a cash cow for the landlord, and an extortionate one at that. Hence a tip for those of you still inclined to go to this campsite after reading this review: When washing up, fill up every available receptacle with hot water while the clock is ticking, and leave them standing on the side while you wash the other items. If that weren't bad enough, you've guessed it: right of access to the dish washing facilities is limited to the same times as the showering facilities! Isn't "ubiquitous" a wonderful word? It was invented to describe those bl**dy tomato ketchup sachets that you get in pubs to accompany the food order. Designed (supposedly) to reduce consumption of the sauce for which the customer was not paying and so represented pure overhead to the publican, in practice they in no way reduce consumption, you just use about a dozen of the blighters when a healthy squirt from the squeegy bottle would have had the same effect (and possibly lower cost to the publican in fact, given the packaging involved), and avoiding the problem of ever greasier fingers as you work through the sachets rendering that much more of a challenge the opening of the next. Ubiquitous is also the adjective to describe "Prestex" faucets in camp sites and similar establishments. This is that wretched invention that parcels out water in discrete quantities as though you were living on Dune (Frank Herbert fans will know whereof I speak). On this site the dreaded Prestex faucets are everywhere - showers and sinks. The motivation is obvious: Water consumption is an overhead for the landlord in proportion to the quantity consumed (all campsites will be metered by now). No campsites have yet introduced a pay-as-you-go water metering system for individual campers (maybe those which charge for showers include a water component and a heating component). So, while a camp site will wish to advertise that it provides running drinkable water, in practice it will put in place every obstacle imaginable to prevent the camper from taking advantage of that facility. Now, the Prestex faucets come in various guises. The most diabolical ones are those which do not release the water until you let go of the faucet having depressed it. At that point water is released until the faucet returns to its original state. This is a very clever design and the one who invented it should suffer the same fate as that of Miles Bennett Dyson (inventor of Skynet's wonder-chip in Terminator 2). These successfully overcome a potential threat to the classic Prestex faucet (which release water as the faucet is depressed) in the form of a portable screw attachment that could in theory be affixed externally to allow for a continuous flow of water. That such a threat has hitherto only been a figment of my imagination, and yet to be encountered in the wild, only adds to my respect for whoever pre-empted my world-beating invention. Some Prestex faucets, in an almost apologetic tip-of-the-hat to the end consumer who actually wants to use the water, have a time delay between releasing the faucet and the subsequent expiry of flow of water. 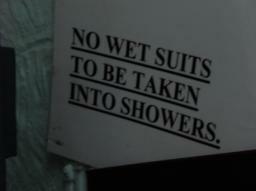 Not so, in this camp site, except in the showers, where anything less would simply not be tolerated. As far as sinks go; you let go, you no get water. Release the faucet and the flow ceases instantly. So if you actually want a flow of water for whatever ablution or function takes your fancy, you had better be able to do it with just one hand, while the other holds down that irritating mechanism. If you tour South America - you are expected to take with you, on your travels, a sink plug, which follows you throughout your tour. It is a universal expectation in that area of the world. Even in a respectable hotel, you should not expect there to be a plug in the bath or sink of the hotel suite bathroom. Possibly this trend may come our way eventually, and some seasoned campers may already have acquired the habit of travelling with a universal-fitting plug. Well, it would have done you no good in this camp site. The perma-plug in this image is shown as "open", but rest assured that any flow of water will close it unless manually held open. So, that leaves you with one hand on the "hair-trigger" Prestex faucet, one hand on the plug, and, er, no hands left to do what you actually wanted to do in the first place. I confess that I find it mildly ironic that water should be regarded as such a precious commodity in Wales, of all places. There is illumination provided for the toilet facilities. They get switched off at 23:00. There is no switch provided to the campers to switch them on after that time, even on a time-delay auto-shutoff as is common. So keep that head-torch with you. I suppose that at least I have to accept that the facilities are kept clean. I will say that the paid staff are extremely helpful and courteous, and I think conscious of the moans that I have expressed in this page (as I am not the only one by any means to have these observations). The staff who independently operate the shop/cafe are also very helpful, in the case of one of our friends going out to get an item that they do not stock. The site's policy of barring individual campers who fail to qualify as a "family" is beyond my comprehension (how much of a ruckus will one individual create?) but of course within their rights. Some of the restrictions are made clear in the site rules as published on the campsite's home page, but certainly not all. 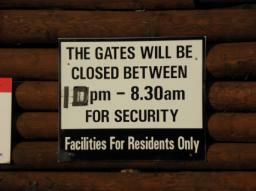 The locking of the gates at 22:00 is mentioned but not the opening up time. 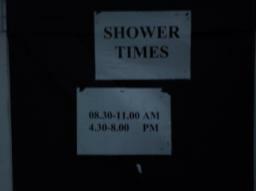 The restrictions on showering times and washing up times is not mentioned. and you can hardly expect them to advertise the abysmal washing up facilities or blatent profiteering on the hot water supply therein. I was going to close with the observation that no camper would return to this site for a second visit who has ever experienced an alternative, but that stretches it a bit. I expect that some do return regularly and put up with the Faulty Towers attitude. Indeed, if your daily routine happens to coincide with the timing at which facilities are made available then the restrictions may not appear too relevant. For me, however, I think that the advertising slogan on the site's home web page says it all: "The best kept secret on Gower" - perhaps it would do well to stay that way.